I was 15 at the time, 35 years ago, and very excited at the prospect of a trip to the British Grand Prix, scheduled for six days after July 11 1971. The French Grand Prix had taken place on July 4, at Paul Ricard, and the first six on the grid were Stewart, Regazzoni, Ickx, Hill, Rodriguez and Siffert. I was never a Stewart fan, but the other five, together with Ronnie Peterson (who qualified a lowly 12th in the March – powered by that awful Alfa Romeo engine), were my favourites. Regazzoni, Ickx, Rodriguez and Siffert were all in V12-powered cars in 1971, in their BRMs and Ferraris, and all four were sportscar legends. As it turned out, the Ricard event did none of them any favours, the BRMs and Ferraris going through an unreliable phase then, although the P160 did come good before long. But at Silverstone, on July 17, there was no Perdro Rodriguez: he’d used the intervening weekend, since the French Grand Prix, to race Herbert Muller’s Ferrari 512M at the Norisring, and a backmarker had pushed him into the barrier, the Ferrari exploding into flame. He just couldn’t resist the chance to race, and paid the ultimate price. 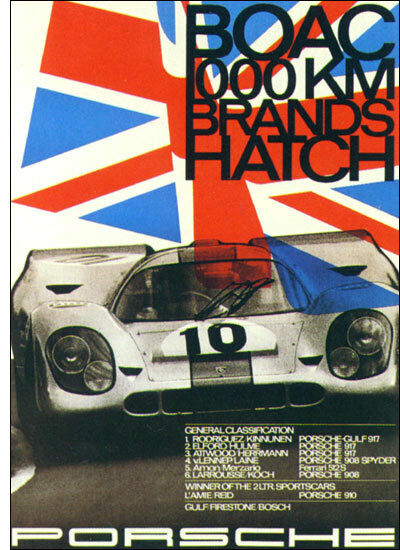 Oddly enough, it probably wasn’t the 1970 BOAC 1000 Kms (where Rodriguez was the absolute master of the wet - this is the official Porsche poster to mark that race, right) that sealed my hero-worship of the little Mexican: it was the 1971 Dutch Grand Prix, when he and Jacky Ickx had raced wheel to wheel for the first half of the race. As the track dried, Ickx pulled out a modest gap, and took the flag with an eight second margin. They’d lapped everyone else – but the top six was filled out by Regazzoni, Peterson, Surtees and Siffert, heroes all. The Goodyear-shod cars were having a dreadful day, Stewart finishing five laps down in the Tyrrell. It was almost the perfect result for me. My all-time hero won, chased home by one of my next most-favoured group. Silverstone’s British Grand Prix was a dull one, and the sense of doom and gloom after Rodriguez’s death continued into the race. The Ferraris and BRMs didn’t last – and Stewart, whose car looked so dull on the track, cantered away to the win. 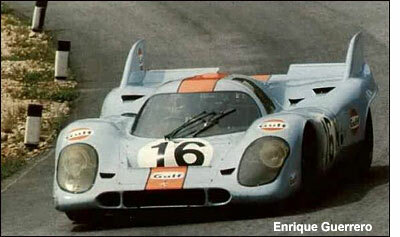 The 1971 sportscar season was effectively over by then – although a week before his death, Pedro Rodriguez had driven one of his finest ever races, to win the 1000 Km at the Oesterreichring. Jackie Oliver had ‘walked’ from the JW Automotive team, to drive in the Can Am, and Richard Attwood took his place in the JWA Porsche 917 for the Austrian race. Rodriguez was magnificent that day: he’d had to pit for a replacement battery, but had charged back through the field, to within sight of the factory Ferrari 312P and the Marko / Larrousse Martini 917. He then pitted for Attwood to take over – for just 12 laps. Perhaps if it had been Ickx in the Ferrari, the result might have been different – but Regazzoni couldn’t take the pressure and crashed, Rodriguez coming home to the final victory for the Gulf 917s: his final victory too, of course. He died a week later. Are there certain parallels between the great Mexican and a man of similar temperament from the modern era? It would be hard to imagine Pedro Rodriguez carrying on driving for a team that didn’t want him to be there – not that you could imagine anyone not wanting him to race for them. But is it impatience, and a sense of not being wanted, that has driven Juan-Pablo Montoya out of F1? He and Pedro Rodriguez both had (have) that ability to excite the fans, and F1 is the loser without Montoya. But perhaps the Colombian’s move to NASCAR will provide him with a drive at one of Pedro’s former ‘homes’ – at Daytona, for next year’s Rolex 24? A Ganassi Riley doesn’t quite compare with a Gulf 917, but watching Montoya get the most from a Riley-Lexus might stir some memories of the late Mexican’s exploits 35 and more years ago. 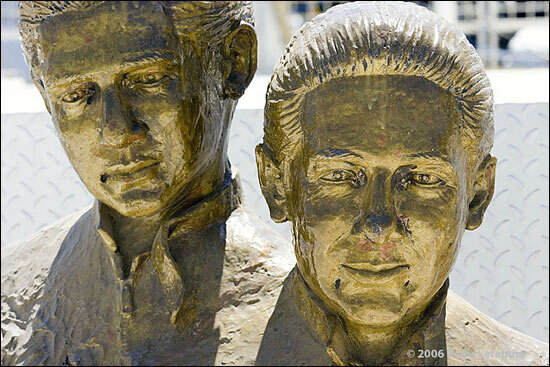 This is the memorial to the Rodriguez brothers, at the circuit that now bears their name, in Mexico City. Ricardo Rodriguez was killed at the track in 1962.